World number two Simona Halep says her body was too "tired" to beat Switzerland's Belinda Bencic in the Dubai Championships quarter-finals. Bencic, who saved six match points before beating Aryna Sabalenka in the previous round, again showed fight and resilience to win 4-6 6-4 6-2. Romania's Halep, 27, had her serve broken seven times by the 21-year-old. "I couldn't serve well because I felt my Achilles, and I had cramping, but there are no excuses," Halep said. She has played nine matches in the past fortnight, having represented Romania in the Fed Cup and reached the Qatar Open final. "The body felt it was tired and, even though I wasn't giving up, I felt I didn't have enough to win. But I played until the end and I tried to stay there. "I'm not worried about the pain, it is just because I am tired and also had too many matches. 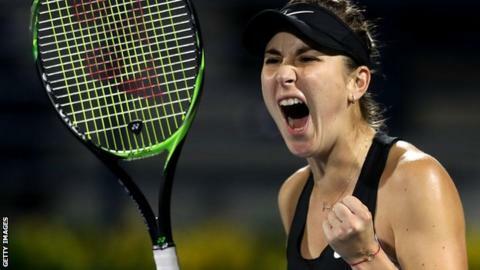 I need a few days off and then I will be OK."
Bencic, ranked 45th in the world, goes on to play Ukraine's defending champion Elina Svitolina, the sixth seed, who beat Spain's Carla Suarez Navarro 6-2 6-3. French Open champion Halep, who is still without a full-time coach after splitting with Australian Darren Cahill last year, was made to pay for missed opportunities in the second set. After failing to convert a break point to go 3-1 ahead, and another in an eight-minute game for a 4-2 lead, the former world number one lost concentration in the ninth as Bencic broke to love and served out easily for the second set. That allowed Bencic to continue to grow in confidence, taking control of the points as she won six games in a row to lead 3-0 in the decider. She regained her double break for a 5-2 advantage and, after a touch of nerves as Halep provided resistance, closed out victory in two hours and 19 minutes. Earlier, Australian Open finalist Petra Kvitova reached the semi-finals with a comfortable win over Slovakia's Viktoria Kuzmova. The two-time Wimbledon champion, seeded second, cruised to a 6-4 6-0 victory, setting up a last-four match against Chinese Taipei's Hsieh Su-Wei. The 33-year-old Taiwanese, who beat Germany's Angelique Kerber in the previous round, took another notable scalp by beating Czech fourth seed Karolina Pliskova 6-4 1-6 7-5 in an hour and 59 minutes.